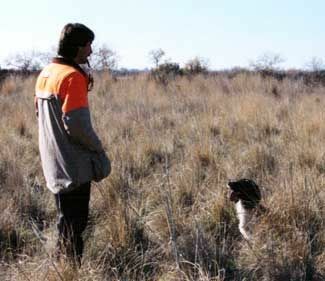 Last issue we discussed the one-man drill training technique employed in teaching a spaniel to develop a proper hunting pattern. This month we will cover the “three man drill”. This is the drill that is most commonly used by professionals for refining pattern work in preparation for the sporting dog games and will produce a very nicely polished hunting pattern. With the use of two additional helpers or gunners to consummate this drill, the handler will be able to focus more on how the spaniel is responding to pattern work and make instant changes to correct the faults that occur in the pattern during that particular training session. Before we get started, let’s review a few items that will be helpful to have beforehand. You will need three large bird bags with two separate compartments inside to store your birds, exclusively keeping your clipped wings separate from your other disciplined pigeons. Many folks will use a game vest as a substitute. My wife, Marcia, finds a good use for those old pair of blue jeans. She cuts off the legs at the knees, sews them up and adds a carrying strap. Viola, instant bird bag with pockets to hold your shells! Each gunner will need to have one as well as the handler. The handler will eventually end up with all the birds at the end of the pattern drill! Additionally, each gunner should carry a shotgun at all times during the running of this drill whether they are shooting over the flushing dog or not. Start your pattern drill by naturally going into the wind. Have a gunner on either side of you set approximately 10 yards away, making a total distance of 20 yards from gunner to gunner. Both gunners should try to maintain a straight line with you, the handler, as you progress down the field during the pattern drill exercise. Each gunner should have a minimum of three dead pigeons in their bird bag at the beginning stage of this drill. We are going to introduce this drill relatively similar to the way that the one-man drill was done. However, here the gunners are going to roll in the birds for the dog to find. Naturally, we first must teach the dog to take an initial cast out to the first gunner and eventually run between the guns in search of game. This is accomplished by using a technique called shaking. Professional Field Trailer’s insist on a spaniel whose pattern covers the ground completely. Here Jason Givens, of Lighthouse Kennels, patiently waits to cast his dog in the final series of the 2000 National Spaniel Championship. Take your flushing dog to the line and show him the two gunners on either side. Now, have him hup facing you, acquiring your dog’s attention and cast him in the direction of a gunner. Have the gunner shake a pigeon while they call the pup’s name in an attempt to attract the dog to him. Some will run right over to the gunner while others will just stare and say what? For those that are reluctant to go, simply tie a piece of fishing line to a pigeon and have the gunner toss it towards the pup. Once the pup starts in the direction of the gunner he will drag the pigeon to him and scoop it up hiding it behind his back. When the pup starts in the gunner’s direction he should toss another bird a few yards out in front of him for the pup to find and retrieve back to the handler. Once the pigeon is delivered, cast the pup off in the opposite direction repeating the same scenario. After a few sessions of this your dog will be very anxious to take the initial cast to the gunner. Now, as we make the initial cast to the first gunner, he will shake a bird until the dog reaches them, once again hiding the bird. When the pup reaches him have the gunner on the opposite side roll a bird in a few yards in front of himself as he calls the pup’s name and then will shake an additional bird to attract the pup. This will entice the pup to cast past the handler to the opposite gunner and find the bird. Now for some pups we might have to let the pup see the gunner toss a bird down to get him to cast across to the opposite gun. This is okay during the early stages of pattern work. We want to develop the windshield wiper pattern at this stage of the training exercise. However, once we have developed a solid cast past the handler we want the pup to find birds on the ground in front of the gunner rather than marking the bird as it is being rolled in. Remember, the more the pup sees birds being rolled in, the better chances are that your dog will start popping!